LOFEE Baby Rattles is a Multi-function toy which popular with Baby. 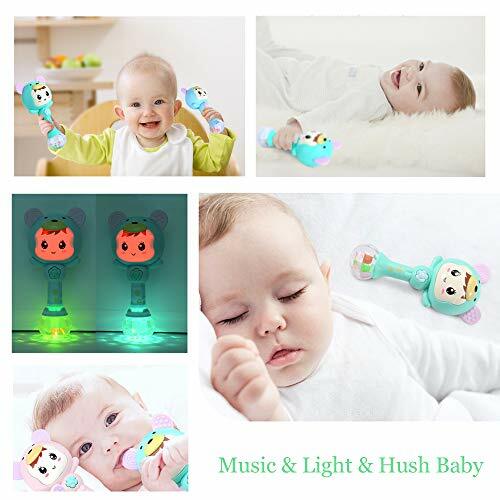 It combines handringing, music player, and teether. 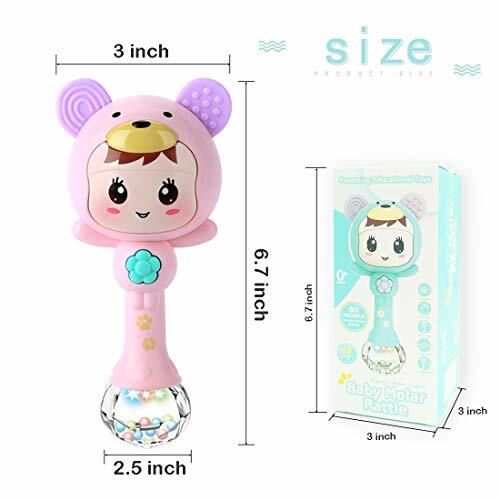 Amazing toy is specially designed for 2 months to 3 Year old baby. Great gift for baby son/daughter/grandchild/granddaughter. 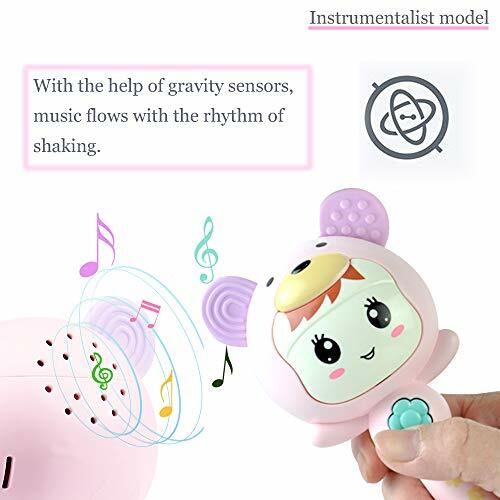 In the first mode, the music will be played automatically, Gently shake will turn it into the second mode, Music or Concert will flow with the rhythm you are shaking. The music comes out is optional, which includes baby laughter, drums, ringing, and 6 soft children’s songs. the faces of cartoon characters and the bottomof the toy can emit various colors of lights. It can attract children’s attention and hush the baby’s sleep at night. You can switch different volume for differentscenarios. The high volume is forplaying with the child during the day, the low volume is for comforting thebaby to sleep at night, and it can be switched by simple operation. For 0-6 months babies, it’s a bit hard to grab the rattle with their hands, and we recommend mothers to use this rattle to attracted their attention. For 6 months to 3 year olds, they can play with the rattle by themselves! ♫ [Gravity Induction] – The music flows with your rhythm. shake it, music play on. guide your baby child to control the rhythm. just like your baby is a music conductor, directing the band playing. 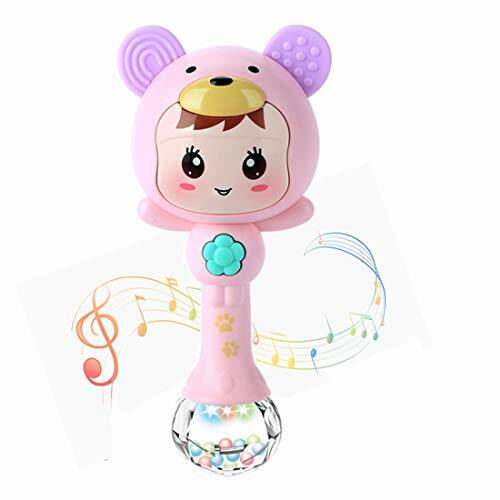 an amazing musical toy for 3-12 month or 1-3 year old baby to develop baby’s music talent. 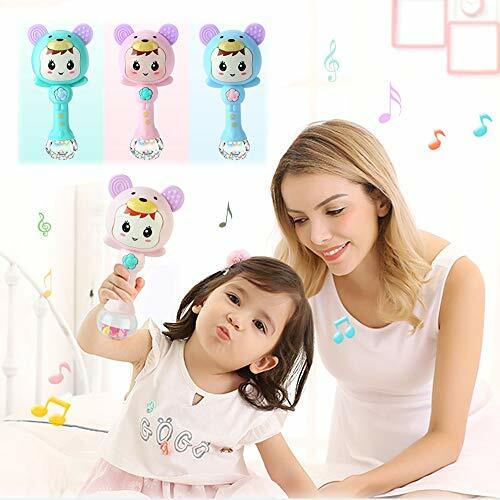 ♫ [Hush Baby] – Mild lighting comes from the shy face of the toy, high-quality speakers make soft music, adjust to the right volume, and switch to autoplay mode. Will turn into an excellent toy for coax babies to sleep. 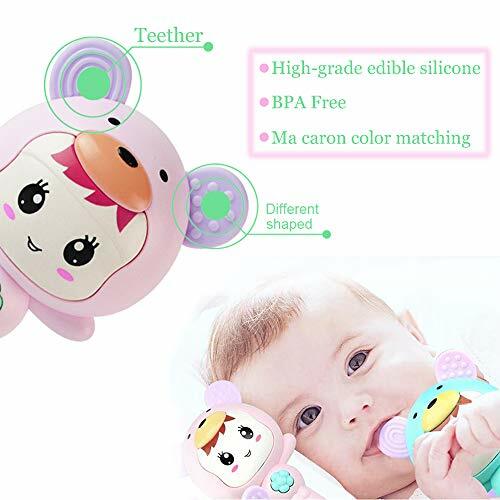 ♫ [Perfect Designed] – Ma caron color matching for baby’s tactile senses and the lower part of the toy is skinny enough for tiny hands to grip, great for practicing fingers control. A rattles that can play music and shine, at the same time, it is still a teether. ♫ [Super Pure] – Durable drop-resistance ABS plastic body shell and edible silicone ears never do any harm to Infantile when chewing. Made of non-toxic, BPA-free and Natural materials, Surpass the baby toy safety standard. 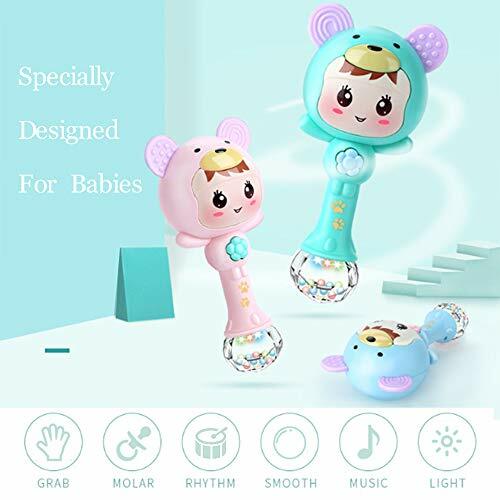 ♫ [Wonderful Gift] – Clear sounds attract children’s attention, wonderful music guides children to control the rhythm, adjustable volume suitable for different scenarios, from newborn babies to 2-year-old babies can’t refuse such an interesting toy. Treat it as a best choice of holiday gifts, Christmas gifts, birthday gifts for your baby.